Episode 231A: Sorry for the delay. At the same time David was recording the last (posted) episode at the KOOP studios, Mac was recording a live Out of Bounds edition MWS podcast at ColdTowne Theater. Here is that bizarro, “earth 2” Episode 231, or – based on common alternate reality naming conventions – Episode 213A. Mac and special guest co-host Lance Gilstrap welcome Jeff Griggs, Jeannie Cahill, and Brett Lyons from the awesome improv group Aphasia. Cruise ship stories, Mothman Prophecies, Mac’s rent-a-cop days, and more. This Saturday, September 1st, the Mascot Wedding Show is pulling double duty (*giggle*). Not only will it be our second show during KOOP’s Fall 2K12 Membership Drive, but we’ll also be handlin’ our bidness live on stage at ColdTowne Theater, part of the Out of Bounds Comedy Festival. 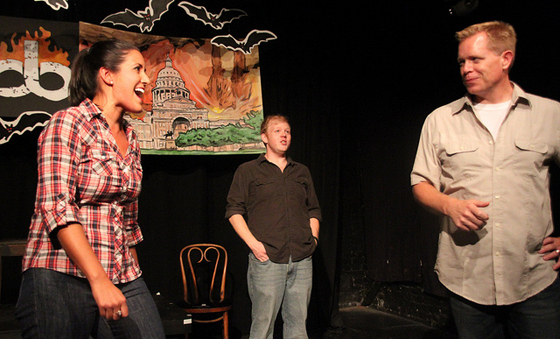 Joining us at ColdTowne, will be Aphasia, an amazing Chicago improv group in town for OOBFest. If you’d like to see the show in person, we’ll be starting the jibber-jabber at ColdTowne promptly at 6PM. Anyone can attend, you do not need a special badge or pass. If you can’t make it out, tune into 91.7 FM or koop.org at the same time to hear the show from the safety of your car, home, panic room, shelter, or fortified basement. And just because we’re going to have a crazy billy bananas time at ColdTowne, doesn’t mean we’re not pushing hard for the KOOP MD. Look over our special MW premiums and memorize this number 412-472-5667 to call in during our show (you can also pledge online here). UPDATE: See? The Austin Chronicle is looking forward to it.